This classic traditional photo album in brown, is great for displaying different size photographs on one page. Designed to take any photograph up to 10x8 inches overall, the album is perfect for photographers who want to scrap book, or display non-standard images. The photos are stuck onto the pages using double sided mounts, photo corners or spray mount (sold seperately) so plenty of scope for sticking and writing captions and even for displaying train tickets, or postcards. 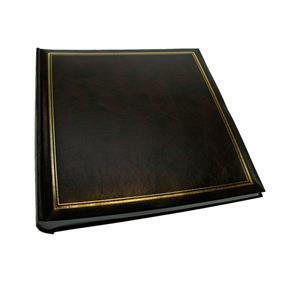 The album measures approximately 11.75 X 11.75 inches overall and is in a really classy dark brwon finish with gold edging around the front cover and gold horizontal lines on the spine, making it look really smart on a shelf. The Classic Album has 50 white book-bound pages, which are made from a lightweight, high quality acid free card and the glassine interleaves between each page, eb=nsures that the photographs do not stick to each other once the album is closed. It is available in three other colours, green, burgundy and blue and will take up to 400 6x4 prints.